Over the past couple of years, in a world drenched with talk about the communicative power of social networks, one can be forgiven for thinking email is as passe as phone booths. Yet, a new study finds that email continues to trump social media channels for reaching online customers and markets. See full article Email still tops social media for online marketing, study says | SmartPlanet. via Email still tops social media for online marketing. What does your business need? To develop Mobile Web or Native Mobile App? Platform Integration: Does your content need to be integrated with other native mobile apps on the device—such as email, cameras, contact lists or other hardware controls? – Then you need a native mobile app. Usage Location: Does data in your app needs to be accessed without Internet access? Then you need a native mobile app. Cost and Availability of Resources: Do you have a small budget? Mobile web app requires standard web technologies. Native mobile apps require greater expertise in various SDKs and specialized languages. Speed to Market: How quickly are you trying to launch your app? Mobile Web apps can be launched without delay; bugs can be fixed instantly; data can be provided as required. Native mobile apps require a review process, which can take weeks and there can be content issues imposed by the App stores. Bugs also take longer to fix and update. Does your target market have access to app devices? : To launch and app you need to develop for iPhone and Android and of course this leaves Blackberry and all those older mobiles that will not have access. The choice comes down to your company’s business objectives and how you want your customers to engage with your company and its content. Don’t forget your customer is the most important target—not the device comes next. The iPad mini has arrived in time for Christmas and it is going to be hot (have you seen one?). This is going to add all sorts of new issues into the boiling pot for web designers around the world because the most popular task done on an iPad is browsing the web and you can bet that will be what the mini iPad will be used for. On top of this there is the new Kindle HD – which is basically a tablet – and the Google Nexus 7. These devices are sporting a new screen size not as big as the iPad and not as small as a mobile but different enough to make the marketing department stop and think. The aim of every serious player on the web is you need to be adaptive and meet demands of visitors using any device. If you run a website whose revenues are directly linked to the quality of the experience they provide to customers (i.e. e-commerce, multi-channel retailers or media companies) then you must be adaptive and you must starting now. The iPad mini may be the device that tips the market. A standard desktop site just won’t work acceptably on a 7in iPad Mini screen. A 12px font will be unreadable; normal buttons will not be clickable and clumsy and form inputs will drive people mad with frustration. Make your text bigger and more readability, we suggest at least 14 px. Add more padding – increase padding and line-height of densely improves touch accuracy. Pay special attention to form elements such as dropdowns, picklists, checkboxes etc. Design flexibility – use design elements that can move around and adapt to the full range of tablet screen sizes – from 600px to 1000px wide. Remove all mouse hover interactions. 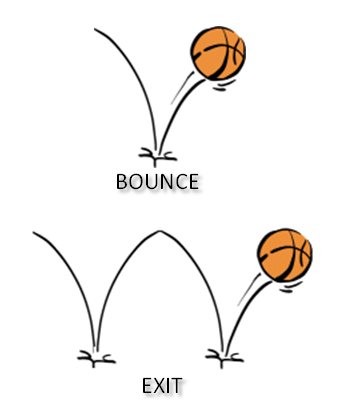 Avoid “position: fixed” design elements – they slow down rendering. Cut down on HTTP requests as this will slow performance. Think about all those links to Facebook, Twitter and Google + that will add more load and slow everything down. Optimize your images – you should be doing this anyway. Many of these tablets have (or will have) fantastic high-definition displays but do not be tempted to deliver high quality image as default it will reduce the user experience. Serve the right quality images when requested. Optimize scripts and styles – keep them as compact as possible. So now is the time to move to responsive and adaptive designs and keep ahead in the market. Google Alerts is a fantastic tool for monitoring the vast amount of online content – you can set it up and then just leave it to work on your behalf. First you need a Google Alert account but then it is part of your Google account – if you look under “More” and then “Even More” it comes under “Specialised Search” (look down the page). The first thing you will want to do is monitor your name, your company or client’s name, product, or possibly a branded term. Enter the query expression into the “search query” field, leave the result type set to “everything” and then fill out the rest of the form to create an alert. You will notice that I have put My Product in quotes this means it will look for that expression. 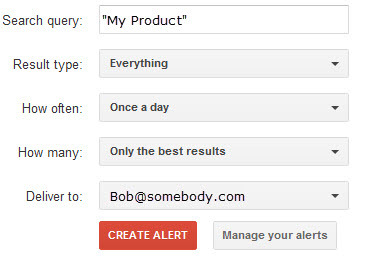 Leave the rest as default and create the alert – so pretty easy to see who is mentioning your product online. You can extent this to a whole sentence if you are trying to follow plagiarists or very specific content. Use minus sign “-“ to ignore websites. If you wish to ignore all comments related to “twitter” then Murray –site:www.twitter.com would do it. Look for word variations. If you want to search for variations then “Murray” OR “Murrey” would look for both spellings. If you want to keep an eye on back links to your website then in the query box put link:http://www.myWebsite.com You can use this to monitor any link – clients, competitors etc. Because Google Alerts is basically running a Google search you can use it to watch just for content within specific websites. This is especially good for targeting competitor sites or specific news sites. In the search query box enter: “I’m looking for” site:http//www.yourMonitorSite.com. This technique is also a great way to monitor listings sites – Ebay, Gumtree – if you are looking for specific items when they are posted you get emailed an alert. Google has a News section on its main search you can use this in your alert if you want to monitor news specifically – so make sure that you have “news” selected from the “result type” dropdown menu. You can add a location to this query – but this can be a little un-reliable. To do this add word location: (the colon is important) and then the country you want to monitor eg. UK, India, Canada etc. I find Google tends to be a bit US biased on it News sites. Google Alerts is a great tool that is much under used, you can have up to 1000 alerts a one time so it should keep you busy. What is it about Social Media and Small Businesses? Social has gone mobile in a big way with constant connectivity – via apps, mobile phones, tablets – at home, on the move and in the car. According to Nielson research, nearly 70% of smartphone owners use their phone while watching television (it’s so annoying); over 50% go to bed with their phone (under the pillow); almost 60% are on the phone while in the presence of friends and family (look at me when you are talking); just under 60% use it while shopping; 47% while commuting and 23% during business meetings or class (give me that phone). If this isn’t enough the same survey found that 28% of bathroom breaks may involve a mobile device! Marketing is beginning to blur the lines between advertising and service, relationships and reputation, experience and outcomes as consumers interact with one another and businesses on a constant basis. Like many disruptive technologies, those business owners that build on this trend and obtain a significant slice of this consumer base will reap long term rewards. Those that hesitate and lag behind may find it more and more difficult to catch up. Savvy small business owners don’t have to tackle all the complexities of mobile marketing today; it is sufficient to create a compelling site capable of meeting the needs of consumers in today’s platform. One of the benefits of outsourcing your social media marketing is the ability to grow with demand – have a team of experts at a fraction of the cost required to hire a full-time member of staff. Just remember, the mobile marketing of today is tomorrow’s connected consumer.